Monday Monday, so good to me. This week at least. It was time for track again. I hoped we wouldn’t be doing more permutations on 1k reps and thankfully we weren’t. Though the thought of 12 x 600m didn’t particularly fill me with joy either. However I tried to stick with Rick in the time honoured tradition. He paced us with great precision as always, completing each rep in 2.20 (approx 3.50k pace). As we only had 30 seconds rest this was quite a hard session but I managed to keep with Rick throughout and towards the end felt stronger and went slightly ahead with Kerry. Our group started with around 10 members but by the last 5 or so it had dwindled to 4. I was pleased with my session. Excellent consistency (thanks to Rick) and I was able to speed up a bit for the last few reps (no silly business though). On Wednesday the Arena tempo run turned into a slowish too long run after Steve and I went back to find some runners who had told him not to wait for them and had thus gone a different way meaning we ran an extra 1.5 miles which made 10.5 for the evening. I was so knackered I got a lift home with Steve for the last 100 metres. It started off as normal, though as it was fireworks night there was a lot of booming and crashing and general jump-inducing unexpected noises and lights. It had been my plan to do a LSR on Thursday but after Wednesday evening I bailed out at 9 miles. 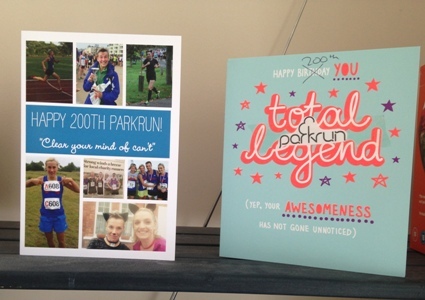 Saturday was my 200th parkrun and I was determined to get closer to 20.30. I did not. Well actually I did. By nine whole seconds. 20.40. Blast! I had set my watch to try and keep myself in the “speed” HR zone. Unfortunately I only managed to be here for around 75% of the run with the rest falling in the “endure” zone below. I don’t know how to push myself more. Practice I suppose. I don’t feel like I am about to expire (because I am obviously not) yet still can’t override the other part of my mind that is happy in the comfortable(ish) zone. At least this time my average HR was lower for a faster time. 20.40 with HR mainly in the 160s compared to 20.56 with an average HR of 179 a few months ago. This morning it was out with some of the Arena posse for another long one. The weather was good for once so the run to just past the Marina and back was ok with no wind or rain. Luckily Rick was out to stay at a sensible speed and keep me going in the last few miles where I had somewhat conked out. Just under thirteen miles for 43 total for the week.